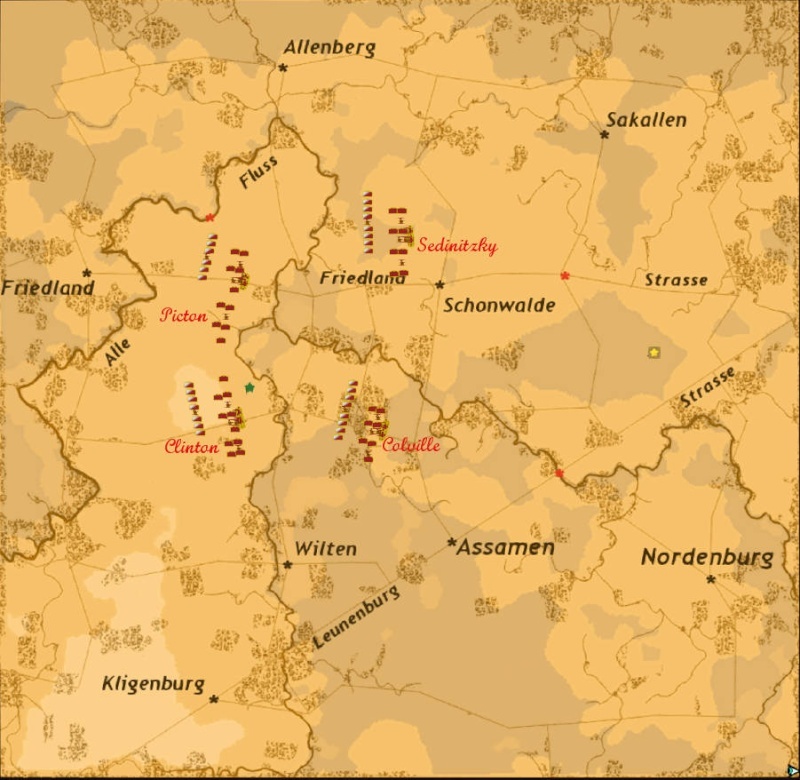 With the rest of the Allied army rapidly marching east, the Prince of Orange and his vanguard are tasked with opening the Friedland Strasse and Luenenburg Strasse ahead of the advance. Till now, this has not been overly difficult as French opposition has been light. Now however, the two roads are rapidly converging. Our cavalry patrols report a strong French cavalry presence from Sakallen to Nordenburg. The line appears to be uninterrupted. It is unknown if French infantry is nearby. Both roads and the ground surrounding them, must be cleared of enemy by nightfall which is at 18:00. Thanks Kevin for yet another scenario. I hope to make this game but am not certain yet - as in last week's Friday game it may be wise if I only take a brigade. Maitland's boys look like the kind of T1000s soldiers I enjoy leading. Are you sure you're up handling 3 battalions? Von Kruse's Nassauers are cool too. Very heroic performance at Papelotte/La Haye. Would be honoured to command them. They usually want to watch some French movie where people talk for 3 hours and nothing happens. We are leaderless before battle. PS: be sure that your uniform is in order when you report to the CinC! I'm available this evening so can take a division. Me too........if my PC can cope. I'd like to participate on the British side, but it would be my first attempt online therefore a complete noob! I should like to have the most junior position possible and be following orders delivered by courier if possible. My game has the K mods. You must get into Teamspeak. hope the battle was fun... the movie certainly was... just like I expected it... lots of action - hardly any plot... perfect! We can't say a word so you can lead us to victory in the near future when we replay it. I think Kevin's computer went off, and he was the host. So we just played half the time, it was plenty of action except for the reserve. Well Kevin and his men were in good shape, so he is above suspicion. I'm not sure, since my division and Morsey's cavalry were about to deliver the coup de grace and snaffle up the enemy baggage train. No doubt that wasn't acceptable so our host accidentally tripped over a few cables.